Have you been enjoying reading the EMiC Community blog? Do you want to post something of your own but are unsure of how to do so? This post will walk you step-by-step through the process of posting your first blog to the EMiC Community space. When you visit any page on the EMiC Website, you’ll see a link to “Log in” at the top right of the page. Click on this link you’ll be a taken to a page where you can enter your login details, which you will have received when you signed up as a member on the site. If you’ve forgotten your password, click on the “Lost your password?” link below the log in box. Once you’re logged in, you’ll be taken to the user dashboard. To post a blog entry, click on “New post” on the top right of your screen (or “Add new” under “Posts” on the left navigation bar). You’ll be redirected to the post entry page. On the new post screen you’ll have the option (on the right) to choose to view a preview, save a draft, or publish your post. Your revision history will be listed at the bottom of the page. 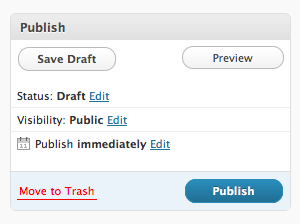 Your post won’t be visible on the public site until you click “Publish”. 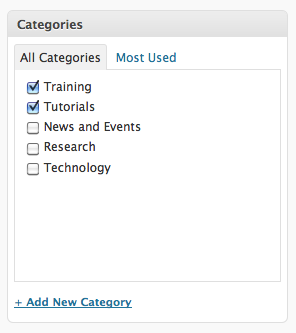 You will also have the option to create categories and tags for your post. You can choose to place your post in the following categories: Training, Tutorials, News and Events, Research, and/or Technology. 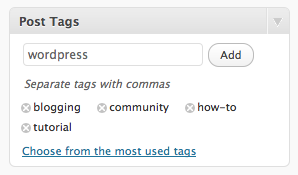 You may also wish to create tags (or keywords) for your post. You can do this in the “Post Tags” box. When you preview or view a post, you might find that you need to return to the editing screen. 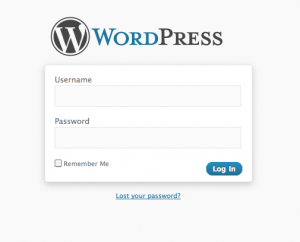 Any time you want to get back to the WordPress Dashboard when you’re logged in, you can click the link at the top right of your screen. It’s really as easy as that! We encourage all of our members to use the blog as a forum for public dissemination of knowledge about all EMiC-related research and training. Your blog posts are a crucial means of communicating with project participants, partners, and the general public. We want to hear from you!! Still have questions? Email me at mbtimney@uvic.ca.